The no. 1 face care brand, Master, brings another Master All-Star Game Face Challenge slated on June 21, 2014, at the Smart-Araneta Coliseum. Now in its second year, the Master Game Face Challenge will feature a basketball match between two teams led by Marc Pingris and Chris Tiu. After 6 weeks given to fans to vote for their top players, fans are going to have a great time seeing PBA, UAAP, Gilas Pilipinas and NCAA powerhouse hoopsters play in the Master Game Face All-Star asketball Challenge this year. 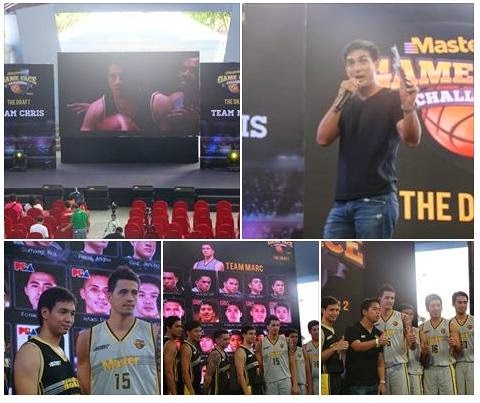 The rare collection of top 12 players representing Team Chris and Team Marc was concluded yesterday. The event was hosted by Jason Webb. De La Salle PEP Squad graced the draft activity with its cheer dance and group stunt. It was also announced during the draft that NBA superstar and Minnesota Timberwolves Power Forward, Kevin Love, would fly into Manila to do his signature moves alongside dunkers from the US. Even though Love is not part of the game proper, he will compete in a three-point contest at halftime of the Master All-Star Game Face Challenge. Get your tickets to The Master All-Star Game Face Challenge this June 21, 2014, at the Smart-Araneta Coliseum. Tickets maybe purchased from Ticketnet outlets.